The Medium was unique to Claremorris and Clifden. It measured three-quarters of a pint, and the thick fluted pint glasses, which remained in use until the end of the 1950s, were very suitable for the pouring of a medium. The popularity of a public house was very often based on the size of its medium. The medium was the standard drink of the day because people were so poor they couldn’t afford to be drinking pints. The pint cost 9d, the medium only 7d, the cheapest alcoholic drink a man could buy. If he had 7d, he had an entrance to the pub and once inside there was always the possibility that some tourist or perhaps some native person home from England on holidays, might arrive in and buy him a pint. The medium was an illegal sale because drink is supposed to be sold by standard measure. The medium was very consistent in its popularity. Ninety per cent of the customers preferred it to the pint because they were under the impression that it was better value than a pint. Medium clients, many of whom were pensioners, were an essential part of the clientele. However, during the 1960s the local Vintners Association decided to end the practice of selling mediums because the nature of the licensed trade business had changed so dramatically and it was time to move on. 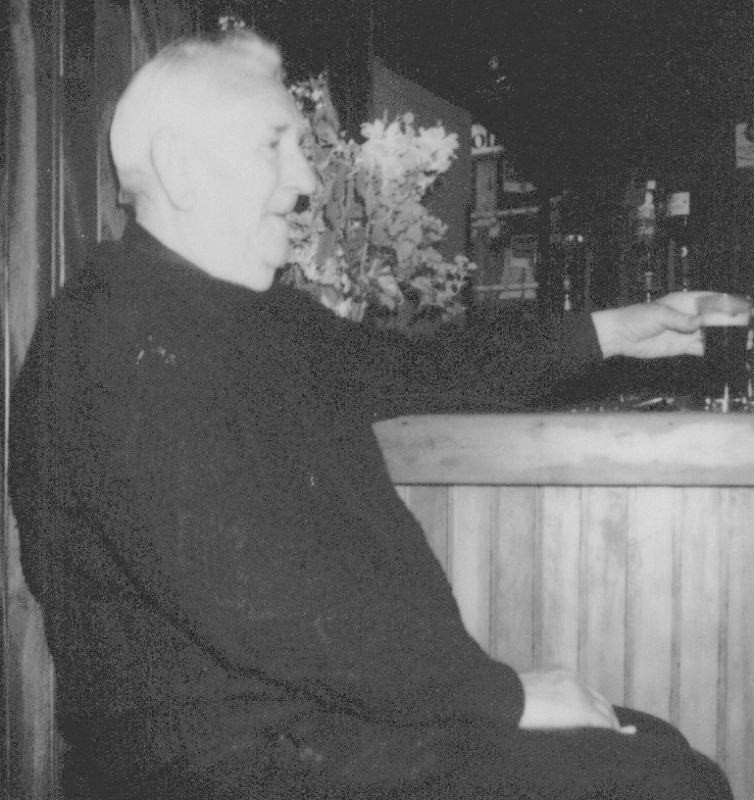 ‘Keeping an eye’…Tommy Mannion enjoying a glass of stout. My family had been in the licensed trade since 1932. In 1935 we bought the present premises from Lydon-O’Neills for £400. The licence fee was £4 a year and was to remain at £4 until the end of the 1970s. My earliest memories of the pub date back to 1939. The pub didn’t really mean anything to a young boy of eleven except that instead of being off playing football with my friends, I might end up having to stand in behind the bar and help out for a few hours. The business was very small at the time. There was no such thing as a full pub. The pub was only a small part of a much larger business, grocery, drapery, hardware or in our case, a butcher’s shop. It was only an adjunct, a room at the back where people could slip in for a drink when the shopping was done. My father was very much a landowner, a farmer and a butcher. He was never a serious publican. If he had to go behind the counter to fill drink, he’d fill it, but he was far happier working on the land. Our pub was always noted as being a Fine Gael pub but we always had customers of every political affiliation including old IRA fellows and World War veterans. There was hardly ever any hassle, as we were well known as being a very strictly run bar where everyone was welcome but messing wasn’t tolerated. My father was a caring and considerate man who sometimes had to be very strict on customers who were over the limit, for their own protection.